Feig and The Heat scribe Katie Dippold obviously see the first two Ghostbusters films as a template to follow instead of inspiration from which to draw, starting things off with a spooky event involving an angry female apparition that pulls the discredited paranormal investigators out of the woodwork. That includes Erin Gilbert (Kristen Wiig), a professor on the cusp of tenure whose past involving published research into the "metaphysical" remained hidden ... until her once-colleague, Abby Yates (Melisa McCarthy), recently drudged it up to increase her own research department's revenue stream. 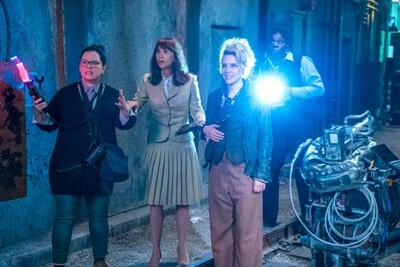 Forced to cope with their waning reputations, the two reunite -- alongside Yates' assistant, the entirely idiosyncratic Jillian Holtzmann (Kate McKinnon) -- to investigate the specter, which unearths the possibility of an ancient evil being unleashed upon the streets of New York. With the help of Patty (Leslie Jones), a savvy public transit employee who's had her own run-in with the paranormal, they form a team to research and potentially catch the supernatural forces with a host of fancy gadgets. 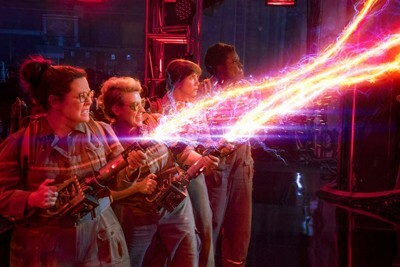 Ghostbusters can be seen as other-worldly territory for Paul Feig: firstly, he's working with a known property instead of an original concept, and secondly, he's operating within the space of a PG-13 rating instead of the R-rated raunchiness of Spy and his other hit-and-miss comedic ventures. 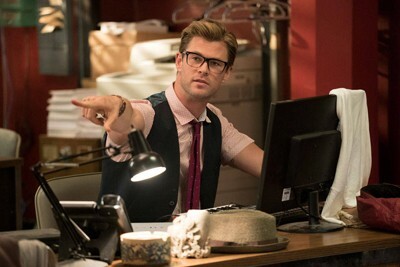 Top that off with the pressures of respecting the franchise, and it's easy to understand why Feig and Katie Dippold might want to play it safe by duplicating the previous films' plot points with slight modifications, giving it the resemblance of a distinct personality while offering longstanding Ghostbusters fans some familiar surroundings. Unfortunately, Feig ad Dippold's script makes little to no effort to hide those clear echoes of the original, even including copious nudges and winks that serve as constant reminders of what Ivan Reitman and his crew conceived, from deliberate mentions of "mass hysteria" and "protonic reversal" to more meta references to overhead costs and memory-altering noxious fumes. There's no doubting that the folks behind the new team adore the originals, and, boy, do they want the audience to know it.